After days of discussions, the UN Security Council has adopted a resolution on Libya that lets the world community “take all necessary measures” to protect the civilian population. Ten out of 15 countries on the United Nations Security Council voted in support of the resolution. Russia, Brazil, China, Germany and India abstained from the vote. The resolution calls for an immediate cease-fire in Libya and also implements an authorization of a no-fly zone over the country. It also says that all countries should act unilaterally and take all necessary means to protect civilians in Libya from the violence that has been escalating over the past month. The definition “all necessary means” gives the UN a lot of room in deciding how to act when it comes to quelling the uprising in Libya. The vote was passed a lot quicker than had been anticipated – it took less than an hour. Vitaly Churkin, Russia Ambassador to the United Nations, said while Moscow did not completely agree with the resolution, they had chose to abstain in the vote, rather than veto it, as they were "persistent firm advocates of the protection of the civilian population." "Guided by this basic principle, as well as by common humanitarian values which we share with both the co-sponsors and the other Security Council members, Russia did not prevent the adoption of this resolution. However, we are convinced that the quickest way to ensure robust security for the civilian population for the long-time civilisation situation in Libya is an immediate cease fire," added Churkin. Speaking to reporters in Tripoli after the UN vote, Khalid Kaim, the Libyan Deputy Foreign Minister, said the Libyan government would “react positively to the UN resolution”, and “will prove this willingness while guaranteeing protection to civilians”. “We are ready for this decision [a ceasefire] but we require an interlocutor to discuss how to implement it,” Kaim is quoted as saying by Al Jazeera. “We also this morning sent a letter to the Secretary General of the UN to give assurances to the international community that we care about our people and we care about the territorial unity of the country,” he said. Upon the announcement of the UN resolution, numerous celebrations began in the opposition-controlled city of Benghazi. The European Union on Friday welcomed the UN Security Council’s resolution on Libya and said it is “ready to implement” it. US President Barack Obama called his British and French counterparts to discuss the latest developments and the three agreed that Libya must comply with a new UN Security Council resolution, the White House said, and that violence against the civilian population in Libya must cease. Obama, Cameron and Sarkozy also agreed to coordinate closely on the next steps and to continue working with Arab and other international partners to ensure the enforcement of UN Security Council resolutions on Libya. 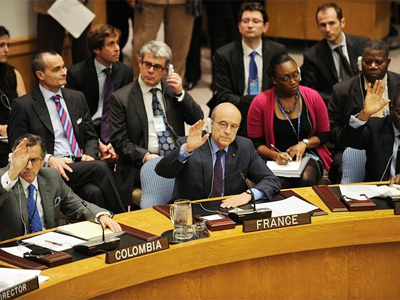 Earlier, the prospect of Russia vetoing the resolution had been widely discussed in the media. However, Russia, along with the other veto-wielding member of the UN Security Council, China, only abstained from voting. The reason for the hesitation was an unwillingness to support any measures that would open the door for military intervention in Libya. 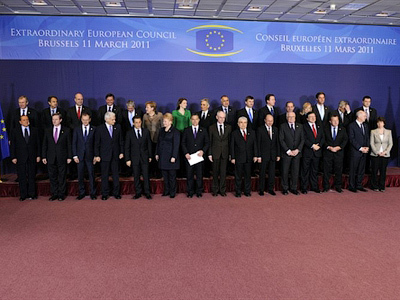 Russia, along with some other countries, had at first called for a diplomatic approach. 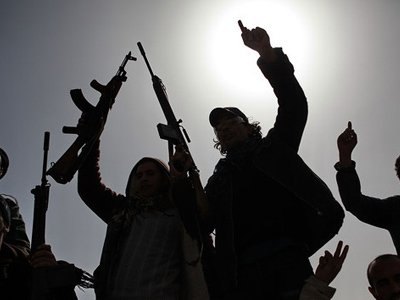 There are fears among many experts that military intervention would only exacerbate the violence in Libya. 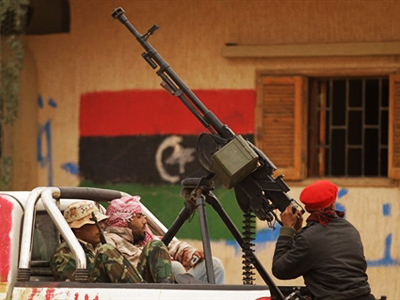 Asia Times correspondent Pepe Escobar says that is something the West has been preparing for – to turn the tide against Gaddafi within Libya. "The problem now is how to implement, especially point four of the UN Resolution 1973. Point four says that all kinds of measures must be taken to protect civilians. This is not only a no-fly zone; this implies the way the whole thing is configured as a US-NATO-Arab League military operation. We do not know how this is going to play out in the field, Escobar says, but this implies they will be able to attack Gaddafi tanks moving towards Benghazi, for instance, and nobody knows when this will stop," he said. But at the same time, the BRIC countries and Germany may not have wanted to block the international community from trying to stop the violence in Libya. This may explain the abstention from the vote, instead of a veto. It remains unknown when the international community will begin to take any action and what will result from them. Britain and France claim to be prepared to act immediately. It has also been reported by many US media outlets that the Pentagon has been preparing for some sort of action against Libya.